The Anatomy of Complications Workshop was the idea of Mr John Taylor (Urological Surgeon and Urogynaecologist) and Assoc Prof Ian Hammond (gynaecological oncologist). In 2000, they were discussing their experiences after a particularly busy weekend on call. They realised that there were some common threads to the situations in which they had been asked to assist their colleagues. These included “getting lost” in the pelvis and being under equipped to deal with injuries. From this discussion, the concept of a course which would empower obstetricians and gynaecologists by improving their anatomical knowledge and teaching them the basics of repair of the bladder, bowel, ureter and vessels was born. 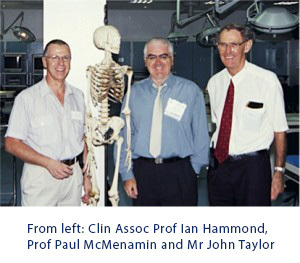 John and Ian collaborated with Prof Paul McMenamin of the anatomy department of The University of Western Australia to develop a comprehensive learning experience using prosections of the pelvis and cadaveric dissection. There have been some modifications and improvements over the years, including the shift to using fresh frozen cadavers to create a very realistic surgical experience. Integral to the success of the creation of the course was the ability of John, Ian and Paul to communicate to others their vision and to collaborate to create a great learning experience. The recruitment and ongoing involvement of a core faculty of facilitators from across the country reflects the respect and esteem in which John and Ian are held. By working so hard to lay the foundations of a great course, they have left a legacy which is unique.